Attracted to black light. I cannot find a match among MPG's Pyraustinae but I did discover a very similar moth here, also from Florida and also unidentified. Please help. Congratulations, Peter. Thanks to Jim Hayden's valuable assistance, you have added a new species for BugGuide. Yes, Dr. Hayden's prompt reply to my inquiry was indeed a surprise. Thank you, Robert, for immediately putting together a rather comprehensive species page for the moth. Will it get a (temporary) Hodges number? Believe it or not, last night, I had a third individual at my black light, but it was so tattered that I am surprised it could fly. It's not worth posting. No, it's not a Blepharomastix. Contacting Jim Hayden obviously paid off - my thanks to him for providing an ID for this moth. Nacoleia charesalis is not listed in BG and MPG: The next move is yours, editors! Thank you. Edit: The pdf Jim Hayden mentions is found here. Eleven days after encountering this individual, another one showed up at my black light. It is posted here. While Blepharomastix ranalis ground is yellowish tan, it's the PM that bothers me. On all specimens on BG and MPG, the PM is relatively straight as it reaches the costa. This PM is more sinuous, curving back up before reaching the costa. Mark Dreiling's specimen looks spot-on for B. ranalis, yet two of his could only be "identified at the Blepharomastix genus level by DNA barcoding." This is Nacoleia charesalis, which has been spreading thru FL for a few years. See News of the Lepid. Soc. 57(1) (I have a PDF if you tell me where to post it). Tallahassee is a jump, but no surprise considering how fast it moved in 2014. Expect it in other states next year. Your observations about the PM line and hollow spot are right on -- not hard to ID from photos. Scholtens and Solis included it in their new Pyraloidea checklist (ZooKeys 535). More than I could expect! Thank you all for spending time researching these types of moths for me. 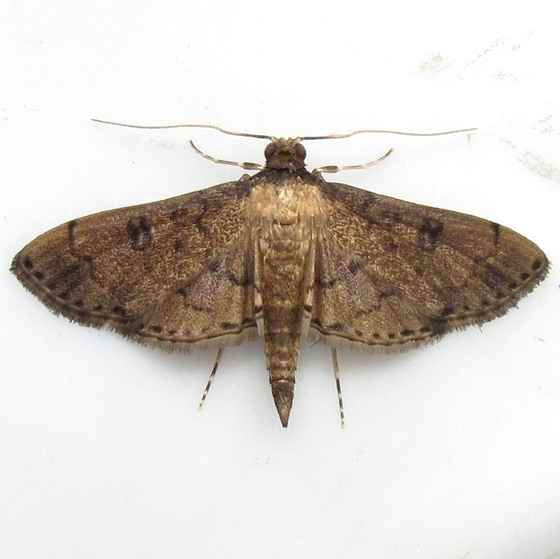 This individual was really as dark brown as the photo shows, and its presumed hollow orbital spot is quite indistinct, also in a photo I obtained last evening with a flash; the posted photo was taken today in daylight without a flash (less glare but more diffuse markings - at least with my camera). Shall it go to the Pyraustinae pool, or to the Blepharomastix page as suggested by Robert? I hate to do this to the poor thing, but I'll keep it for possible later analyses. We are thinking the same. I think it is a poorly marked . I had a lot of them this fall and all were brown like this. I could not find any other species that had that hollow spot and PM line joining fringe. I was thinking I can barely see one here. I DO know there are two obvious ones on all of the ones identified here. I looked a lot but will check the spread plates, which I did not do, just checked all the Blepharomastix. If this isn't it I would think it is a new species. Well, I thoght they had some different looks but I had a Mimorista out of place so let's throw this one into the mix here. Guess I will have to try sending one to BOLD. I had never considered them questionable. Opened a can of worms, eh? And I became the beneficiary! Thanks again. ... from this exercise. It's the questionable specimens that we learn the most.